Hello, spring! Weather in my area has finally cleared up into something resembling a season between Hoth-like winter and Tattoine-esque summer. I debated on putting up a WIP post this month. Aside from Belle, I haven’t done much crafting this month. 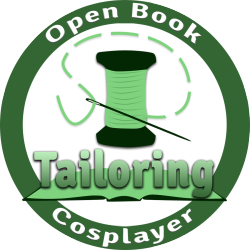 February and March have been more than a little hectic for me professionally and personally, so I haven’t been able to get as much sewing done as I’d like. Especially non-cosplay stuff. I have a new work Cambie sitting in limbo right now, which is such a bummer. Hopefully I can knock it out when I get back from Portland! Gotham Girls: I’m working on several catsuits for a Gotham Girls group in May, including a Batwoman for myself. The other suits are a Huntress for Callula Cosplay, a Stephanie Brown Spoiler, a Stephanie Brown Batgirl for Mia, and possibly a Harley Quinn. 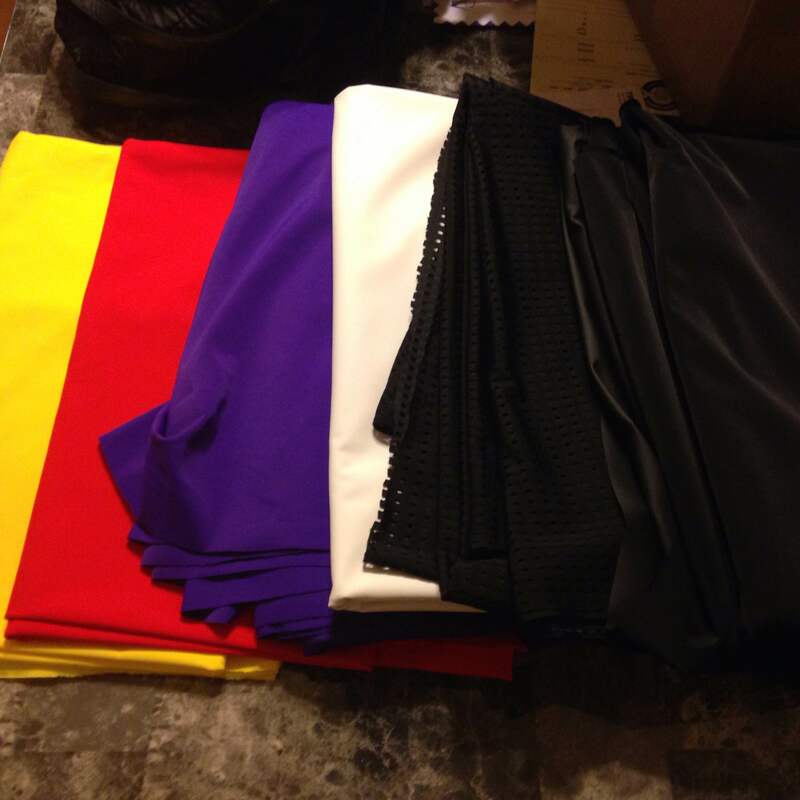 I finally got all the fabric in, so my plan is to set up shop and knock out the majority of the suits next weekend. We’ll see how it goes! My quilted fabric for Margaret and some sample swatches for Lulu. Margaret from Persona 4: Early this year, I mentioned that I’m joining some friends for a Velvet Room group. 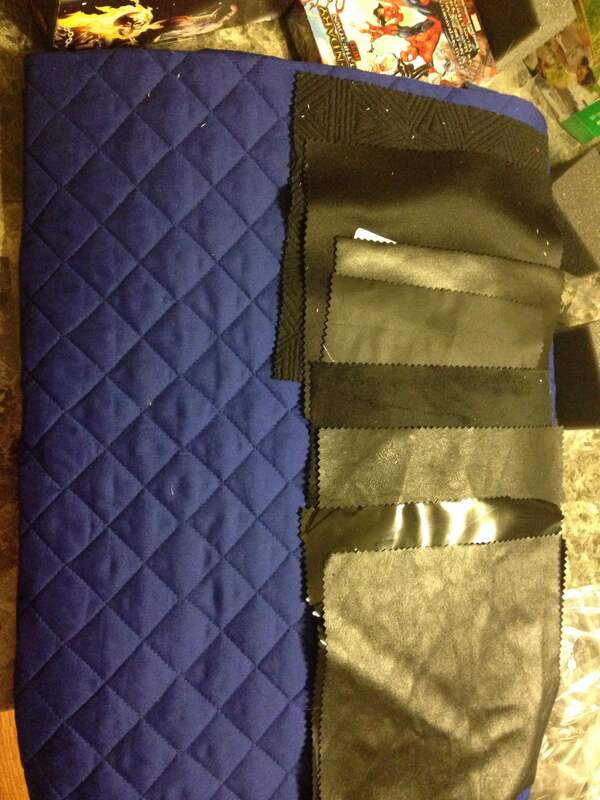 I finally found some quilted blue fabric in a good color, and I ordered my wig and contacts. I’ve been talking to other Margaret cosplayers to figure out the front panel of her coat/dress. Some people do it as an entirely separate piece that attaches with snaps, while others actually hand stitched the front panel on. I’m still debating how I want to handle mine since I don’t want it to be too bulky. Either way, I’ll more than likely have to do some *shudder* dyeing. Blargh. 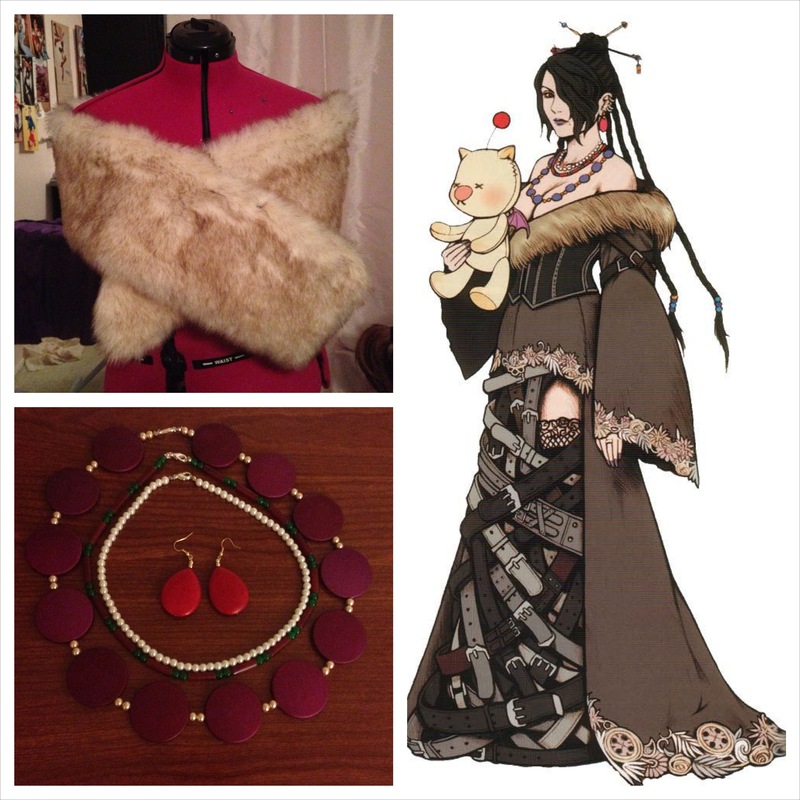 Lulu from FFX: It has officially started! I’m still mostly in the materials-gathering phase, but I’m trying to knock out some of the smaller pieces of this costume so that it’s not too overwhelming come summer. After months of searching, I finally found a faux fox fur for Lulu and made the stole last week. It’s lined with poly purple haubuti I snagged from Golden D’Or at their last sale. Since I couldn’t pack my sewing machine for my trip to Portland, I brought my jewelry supplies and started working on her necklaces and earrings. Next up is the moogle and raiding ALL the local thrift stores for belts! What projects are on your craft table? Haha, it’s definitely my big project for the year. I’m dreading the skirt of belts! Belt donations anyone? :p I went through the same thing when I did a Morrigan (Dragon Age) cosplay, never seen so many belts. Hahaha, I should set up a belt donation bin. All the belts! I can’t wait to see all of these! And Margaret look super intricate, but, like she will be an AMAZING cosplay when you’re finished!